Copyright 2011 Australian Academy of Forensic Sciences. Forensic science is increasingly relied upon by law enforcement to assist in solving crime and gaining convictions, and by the judicial system in the adjudication of specific criminal cases. 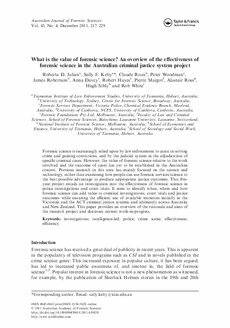 However, the value of forensic science relative to the work involved and the outcome of cases has yet to be established in the Australian context. Previous research in this area has mainly focused on the science and technology, rather than examining how people can use forensic services/science to the best possible advantage to produce appropriate justice outcomes. This five-year project entails an investigation into the effectiveness of forensic science in police investigations and court trials. It aims to identify when, where and how forensic science can add value to criminal investigations, court trials and justice outcomes while ensuring the efficient use of available resources initially in the Victorian and the ACT criminal justice systems and ultimately across Australia and New Zealand. This paper provides an overview of the rationale and aims of the research project and discusses current work-in-progress.